Note: This post is really old. Some of these websites are running today. I’ll create a new post soon for 2017! As designers we try to get feedback to our work to both improve and grow as a creative thinker. 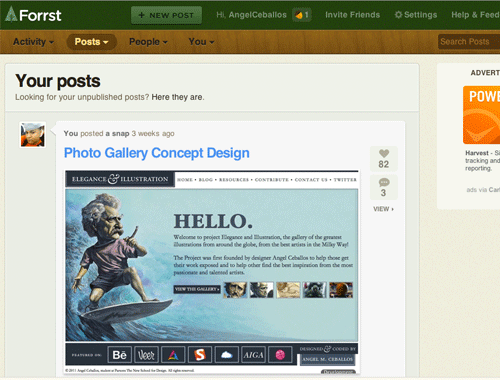 Online communities help designer, developers and creative types showcase their work, gain thoughtful feedback and most importantly help expand networking possibilities. There are many online communities, forums and social networks for designers but I wanted to make the process for searching for them and went ahead and hand selected these 10 essential community sites that I think will benefit others the most. Of course there are other great websites that might not have come to my attention but if you find one that you think is worth sharing, please feel free to leave a link in the comments section and for others to visit. Note: These websites are not listed in any particular order ranging in rank or popularity. Dribbble is a wonderful community for designers to feature their work or work in-progress as screenshots at 400 x 300 pixels (px). 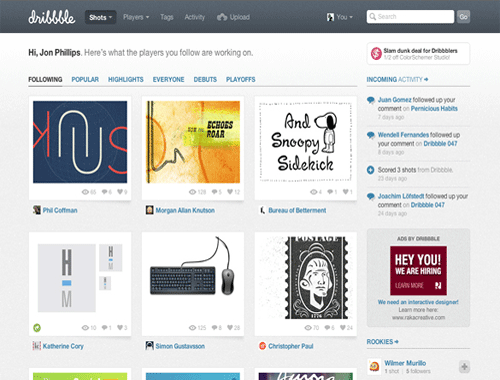 Dribbble is currently an invite-only and has become an outstanding place for inspiration due to the hight quality work talented designers who invited. If you don’t have an invite, it’s okay; you can still sign up as a spectator and follow your favorite designers on Dribbble. 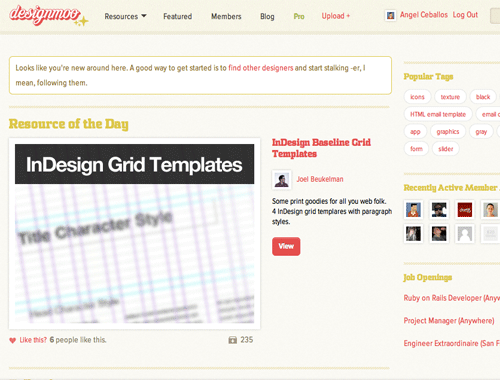 You can also add yourself to the Dribbble Prospects directory to get a chance to get an invite. There are also sites that show you ways for obtaining an invite. 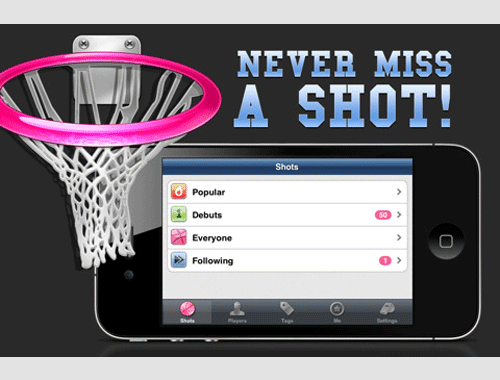 There are also amazing application for both the iPhone, iPod Touch and iPad that you can download to take the Dribbble experience on the move. 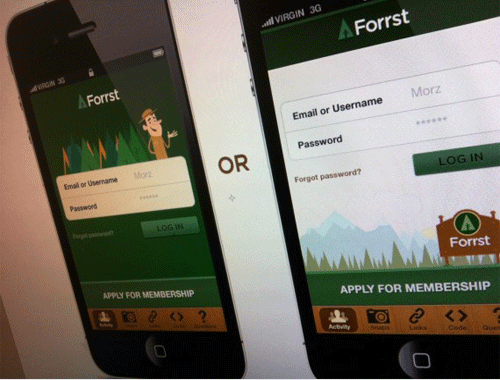 Forrst is a invite-only community for passionate designers and developers. The main focus of Forrst is to share with the community, help yourself and other get better at their craft by providing thoughtful critiques and become more knowledge in the field. Once you’re a member of the Forrst community, you can browse great content or share your own insightful links, snap shots (or screenshots) of the work your working on, share code (i.e PHP, HTML5, Ruby on Rails, Node.js) and ask questions on any design or development related topic. Get your questions answered by a knowledgeable community or answer questions to help others as well. 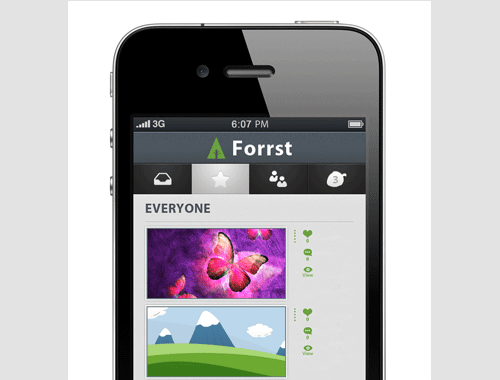 At the moment, Forrst is a invite-only community as mentioned but you can currently sign up using promo code: holidays2k11 There are a few developers working on iPhone, iPod Touch and iPad applications for Forrst. 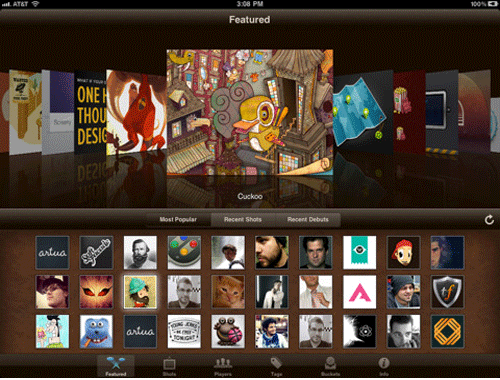 Below are several screenshots of the application. Behance Network is familiar with the community to designers as it has grown in the last several years becoming a very promising platform for creative professionals. For those that have not heard of Behance it’s an active community of creative individuals to feature their work and get thoughtful feedback on the work uploaded. It is simple to get start on Behance in just several steps by simply making profile, uploading some of your work and receive feedback. The amount of feedback may vary per designer based on their following, inner circle and how involved they are in the community but overall the possibilities are endless. 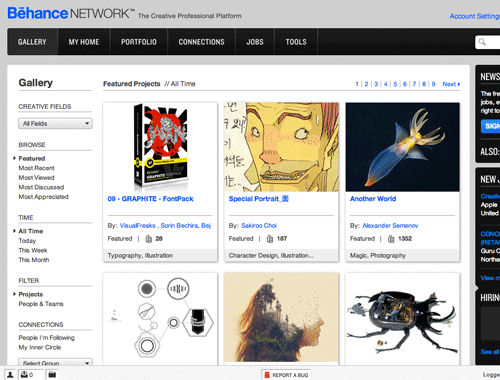 You can sign up to the Behance Network by visiting this link. The team at Behance also host a wonderful conference called 99 percent and a the 99% blog that has many resourceful articles, topics and videos. If that wasn’t enough by the Behance team, they also have a wonderful application for the iPhone (Free), iPad ($1.99), web application and offline print products to help you manage your projects more productively called Action Method. You can read more about Action Method on their site here. DesignMoo is a different type of community compared to others we have previously mentioned in this post but can be a wonderful source. The DesignMoo community of designers share free resources they have like fonts, brushes, textures, icons, illustration and any other resources that might be useful for the community. The goal of the founders of Designmoo is to build a community for designers to find free resources for their projects and share their free resources they have with others. The community is curated by Rich Hemsly, Chris Wallace and maintained by the great folks at Lift. Designmoo is currently and invite-only community at the time of this post but I will soon be posting about a give away for invites to the Designmoo community, stay tuned. 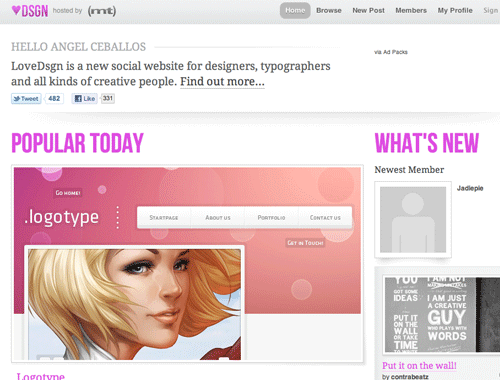 LoveDsgn is an invite-only social community for designers and other creative professionals. It is similar to Forrst and Dribbble and is yet another wonderful online community for designers to feature their work, gain thoughtful feedback, network with other creative designers. If you don’t know any members of the community (I’m a member of all these communities in this post, you can follow me on LoveDsgn) you can sign up for an invitational invite here. I will soon be giving away invitations to LoveDsgn in one of my future posts for a selected passionate creative designers. One of the toughest problems sometimes designers run into is deciding what colors to pick for project but there is a solution for both that and for those that love colors (like me!). The amazing community ColourLovers is the site that is highly essential on your list as an artist, designer or a creative professional looking for the perfect color inspiration. You can pick from a large range of projects you would like to view from and work that has those colors based on the community summited projects or you can submit you our projects. When you upload your projects you get a wonderful lengthy (at times) feedback on your projects.If you just want to find beautiful color palettes, patterns or maybe even create your own than you are in the perfect community for you. 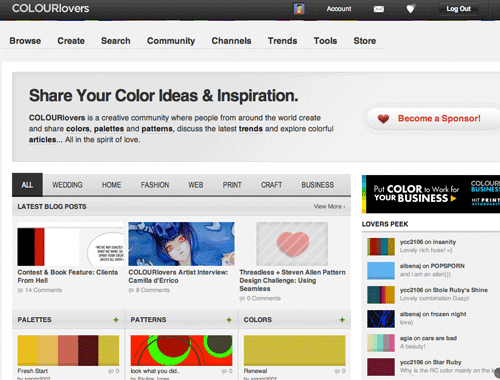 There are also very helpful forums, groups and articles that found on ColourLovers. You can sign up at anytime by visiting this link. There are also wonderful application for the iPhone and iPod Touch to take your color schemes on the go with you. 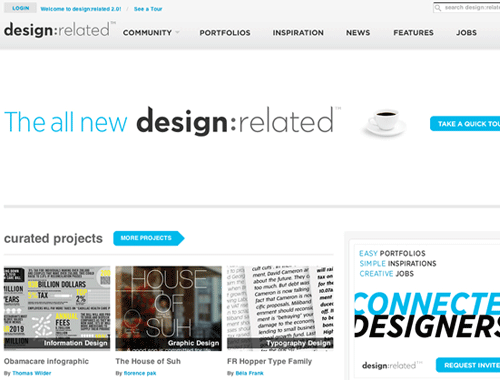 Design Related is yet another invitation-only community site but is totally worth the wait with the quality inspiration ready for discovery for fresh inspiration. Now when I mean quality inspiration, I really mean it —the level of work on Design Related is impressive. You can view inspirational work from talented creative professionals from around the world, create your own portfolio and network with other creative thinkers in the community. 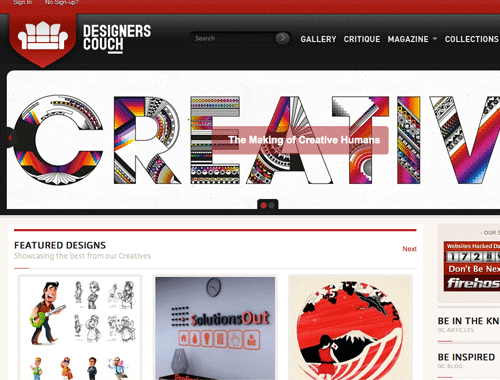 Now DesignersCouch has by far an impressive amount of quality work on the community submitted by some of the most talented creatives from around the globe. This community curated by creatives and made to inspire others through this creative platform. You can feature your portfolio, get constructive criticism from a knowledge community, view other inspirational work that can help challenge yourself and help you grow as designer. It is personally a must join community and definitely essential to any passionate creative professional as a source of inspiration, networking platform and an opportunity to gain exposure. Drawar is a different type of community than those mentioned in this post as it’s considered a discussion-forum-based social community site. It is definitely essential for designers or developers looking for answers to their questions when they run into trouble or want to give feedback and help others out in the community than this community is perfect for that. 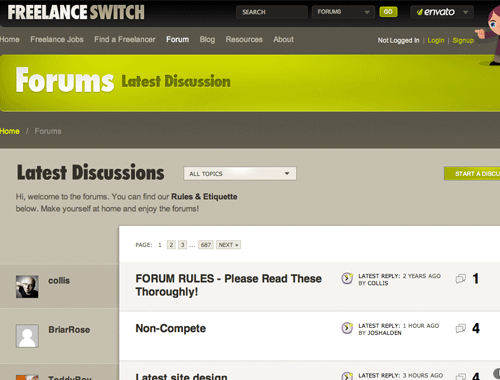 FreelanceSwitch forums is a bit different from the one mentioned above, but I think it deserves its proper place in this posts as an essential community site for designers as it has helped me out when I got into a pickle sometimes, and I think it will benefit other designers with who are looking for specific answers. The forums on Freelance Switch is a great place to ask questions, start topics, gain insightful information and resources on a particular subject or even just network and help others. There are many more wonderful communities online. 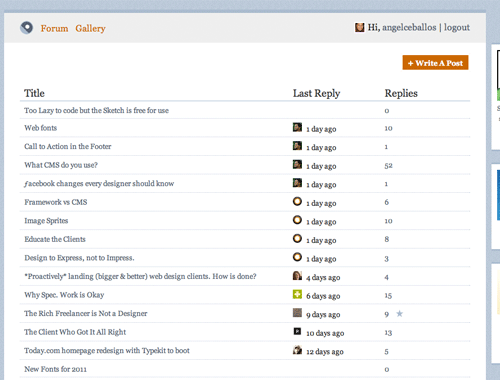 These are some additional communities I think are worth noting for designer, developers and freelancers.